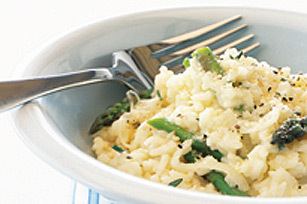 This simple Spring Risotto gets its deliciousness from fresh asparagus and Parmesan cheese. We've simplified the method, so all you have to do is follow the recipe and you'll be serving up homemade risotto in no time! Melt butter with oil in a deep frying pan on medium heat. Add onion and garlic; cook and stir 2 to 3 minutes or just until tender. Stir in rice. Add broth, milk and asparagus; mix well. Bring to boil. Reduce heat to low; simmer 5 minutes. Add 1/4 cup of the Parmesan cheese, salt and pepper; mix well. Sprinkle with remaining Parmesan cheese just before serving. Provides more than 5% RDI for Vitamins A & C, Calcium and Iron.